That old saying of “saved the best for last” is certainly up for debate as we wrap up the mid-week revisit of an October Lake Storey outing. What isn’t debatable is that I saved the best catches for this final posting, one of which established a new lake record. That bass and more for the finale so here we go. Record Holders – Thinking back I wish I would’ve shot a little GoPro footage while Brent and I took shelter and ate our lunches in his truck (which Dad had driven out to the lake for a timely visit). 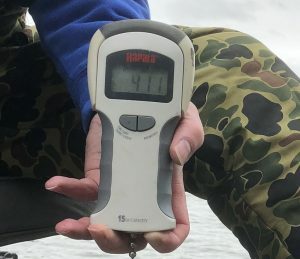 After all, it’s not every day that you get three Lake Storey Top Bass record holders hanging out lakeside shooting the breeze about the longtime fishing hole. Then again, some of that discussion would reside in the “Top Secret” category so perhaps better to be off the record. 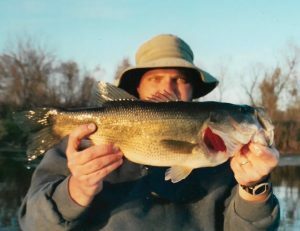 Channeling Nostradamus – Leading into this trip I took a look back through the Lake Storey record book to confirm some of the data on the family bass record from the spot. Turns out there is a general pattern that results in a new record about every ten years. Just for the fun of it I made a bit of a prediction in the Facebook post shown above shortly before heading out from home to try our luck. 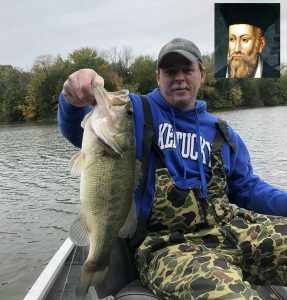 I’ve got to say that it was pretty cool for Brent and a bass to make the prediction a reality. Brent had no idea that I had made the predictive post and probably thought I was a little too excited as I awaited the weigh in saying, “Oh man, this is good, this is real good, gotta be 4-9, this could really be good…” Once it locked in at 4-11, I explained my crazed reaction and even made a Facebook update post from the water. Oh yeah, I guess Brent thought it was a pretty cool catch too. 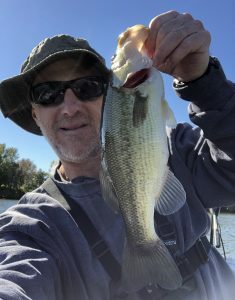 Last Cast Bass – As our day drew to a close and we neared the boat ramp, I glanced at my watch which read 2:48pm (yes, I still keep time with a watch and not a “phone” but I do take pics and video with a “phone”). I mentioned to Brent that I was good to call it a day if he was okay with trailering the boat a few minutes earlier than our original 3:00pm quitting time. 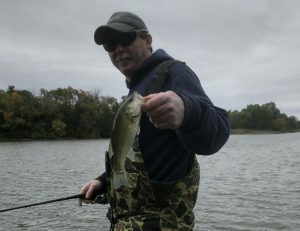 Wisely, he opted to pay one more visit to a nearby laydown and at 2:52pm he reeled in our (actually his) second largest bass of the day at 3-8. Only then did he decide it was time to head for the ramp as what better way to end a stellar day than with a last cast, quality bass. 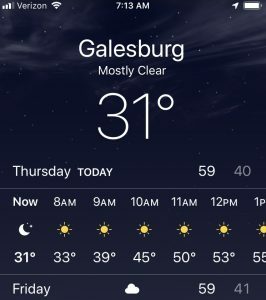 Was the new Lake Storey record actually foretold by Nostradamus? Read on and decide for yourself. I’ll leave you with one odd, final note to close out this whole Lake Storey adventure. After my “prediction” came to fruition, I did a little research (or something like that) on some of good, old Nostradamus’ predictions which were typically written in a four line literary form referred to as a “quatrain.” Turns out that there’s a great deal more of those quatrains that have yet to find any sort of supposed tie to a historical event than those that purportedly do. And by some stroke of luck, while burning the midnight oil during my exhaustive search, I did find the following gem that someone attributed to the legendary soothsayer. 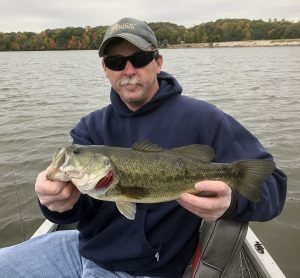 A couple other highlights of our outing involved crossing paths with a pair of fellow anglers who have made more than a few casts at Lake Storey. The first one we met on the water (twice) and the second we met on the bank (twice). Top 5 angler, John Kirkemo, in the background as noted by the arrows. The white cloud represents his reported misfire with the fire extinguisher in his boat which unfortunately was not caught on video. Top 5 Trio – Brent and I ran into a fisherman on the water who stated, “I’m looking for the Jackson brothers” as we crossed paths. Now, what are the odds that three Top 5 anglers would find themselves chatting out in the middle of Lake Storey just a bit east of Freak’s Point on this morning? Actually, pretty good, as Brent and I were aware that fellow Top 5 angler, John Kirkemo, also had a trip planned. Dating back to 2014, the Top 5 project has resulted in a fun batch of fishing banter with more than a few fellow anglers. 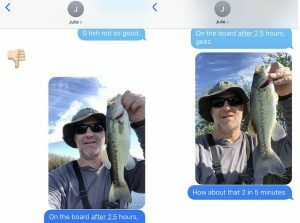 Add John, a Top 5 “rookie”, to the list for 2018 as we have shared a considerable amount of electronic fish stories, opinions and laughs over the course of the year. 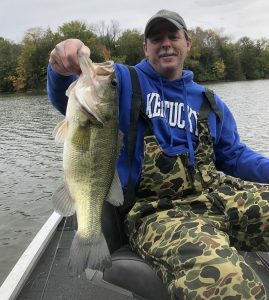 Sure was nice to share more of the same, not only in person, but also while floating on the surface of one of our most popular fishing topics. 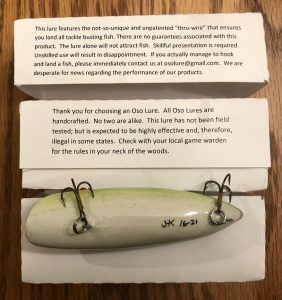 John Kirkemo’s creations represent a perfect complement (and compliment) to whatever you call this writing thing I do as while I am certainly serious about fishing I don’t take it too seriously. 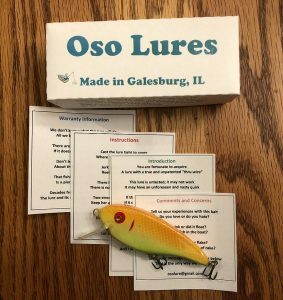 OSO Lures – In corresponding with John, he had mentioned a hobby he’d taken up to feed the fishing fix when off the water, crafting some lures. 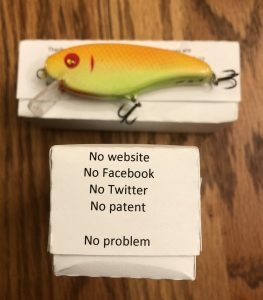 Earlier this year he’d passed along a few pics of the baits complete with his fun and unique take on product packaging and presentation. And now I am a fortunate fisherman to have a pair of his creations in my possession. A generous offering from a fellow fishing fool (take that how you may). Very cool and icing on the cake to the encouragement John has provided upon reading my rambles. Perhaps his creations can also provide a topic to delve into a bit further during the off the water portion of the calendar that looms on the horizon. The figure in the background knows a thing or two about Lake Storey and apparently a thing or two about the guys using his boat as he showed up just in time to provide a reprieve from some rain. MVP Race – While Brent wound up taking the unofficial title of “Most Valuable Participant” on this outing, another guy also received considerable consideration. We spotted Dad on the bank at a handy access point at a most fortuitous time although it turns out that he’d been stalking us from a distance for a while (actually said he saw us talking to “that John guy” about a half hour prior). As the rain that was not in the forecast began to pour we beached the boat, grabbed our lunch buckets and made a run for Brent’s truck that Dad was driving as Brent had driven Dad’s to the lake with boat in tow. As we enjoyed the lunch break, Dad (aka Papa to our kids) laughed and reminisced telling Brent and me about how his dad (our Papa) used to show up on the periphery of the trapline with some grub and conversation back in the day. However, Dad’s contributions did not end with providing a dry truck. As shown in the video clip below, he followed up with a run back home for some dry clothes as a couple of his boys didn’t pack so well. Fortunate to have dads who are good like that and ours saved the day as we were experiencing a few shivers in our rain dampened clothes. A final note for today comes from our second on the water powwow with John after the rain had passed through and we met again not too far from Cannon Hill. He mentioned that he saw us disappear for a while during the twenty five minute or so rain delay. We related the tale of Dad’s timely arrival with a shelter vehicle as well as his run back home for a load of raingear, sweatshirts and towels. I believe the word that John then used to describe us was “pampered.” We had a laugh at that assessment. Right on the money too, considering Brent and I were conducting our second visit with John while sitting in the bass boat that Dad kind of, sort of, in a roundabout way, bought for us back around 1987. 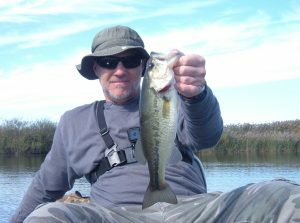 Yep, nothing wrong with a bit of good natured ribbing and all the better when you are warm and reeling in some bass on a challenging fishing hole. 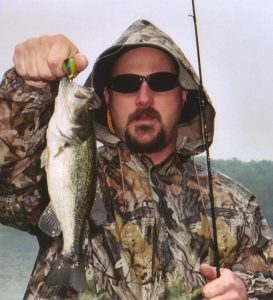 My standard format for a fishing report consists of stats, notes and pics. Since launching my own blog I have also instituted an annual “Lake Lowdown” feature as a variation on that standard report. But usually there’s even more stuff that goes along with those outings that simply gets left out due to time, space and modern attention span constraints (also a little leery on occasion of sharing some of the secrets and silliness) . 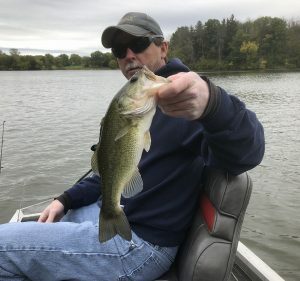 The October 19 outing to Lake Storey with Brent was such a trip and as I always enjoy talking about that fishing hole, well, I’m going to talk about it some more for the next few days. Sort of an extension on the “Notes and Nonsense” bit from the regular report. Breakfast Burrito Banter – My typical source of nourishment for the drive to my fishing holes consists of a homemade breakfast burrito whose contents can vary based on whatever is in the fridge. However, the later start of a Friday morning Fall outing (to let things warm up and help get kids to school) combined with payday afforded a chance to splurge at the neighborhood Sonic. 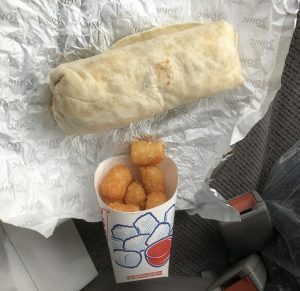 Folks, I give you the SuperSonic Burrito, complete with jalapenos to start your day right (video commentary below). NOTE: I am aware that I spelled “Y’all” incorrectly but lack the time to edit, I try my best but oh well, is it even a real word anyway? 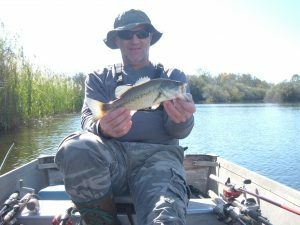 Designated Driver – It’s commonly accepted knowledge that the angler in the front of the boat has a bit of an advantage over the angler in the back. Often when Brent and I fish together in the “big boat” we’ll split the time doing the driving. However, on this occasion I was perfectly content to give up my shot. 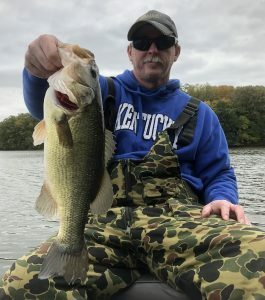 After a full day on the trolling motor the previous day, I was a little sore and with the windy conditions I truly didn’t feel much like battling the elements. Besides, I realized long ago that Brent doesn’t need to “front end” me to have the upper hand. 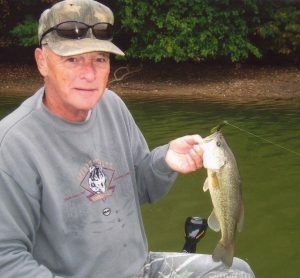 I was perfectly content to relax in the back, go about my regular approach, enjoy the spinnerbait lesson, take some pictures of his quality catches and only get outfished 10 to 7. 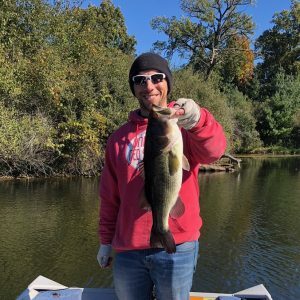 Spinnerbait Clinic – I had gone full in on a spinnerbait bite on my solo visit the previous day after nabbing a bass on the bait on my first cast. As this lure type is probably Brent’s top weapon, I was not surprised that it wound up landing all 10 of his bass on our trip together. It also spoke volumes to his skill in fooling bass with one that he didn’t miss a beat after his old faithful Emiquon Special bit the dust after his first catch, a solid 2-7. Having no spare Emiquon Special in tow, he opted for a good, old white spinnerbait and proceeded to end the day with a pair larger than that first bass including the new lake record of 4-11. 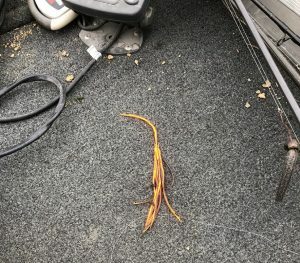 Remnants of The Emiquon Special and the Plan B spinnerbait that came through big time, dig those copper hammered blades. Angler Comments: Really thought I was going to get shutout for the day as I was fishing for over an hour without even a bite. Redeemed myself as dusk was setting in with two small ones and this 3-13. All on a weedless senko. Angler Comments: Had been fishing for a few hours and only managed one small fish. Was fishing a far corner of a lake and he slammed my spinnerbait just within a couple of reels of lifting it up and over the outside weed edge. Short fight ensued. 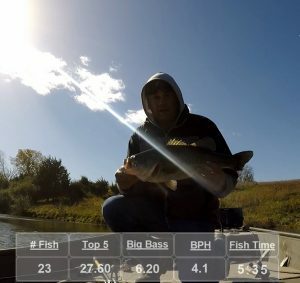 NOTE: Mark Balbinot also put together a cool data filled video of his batch of catches that I definitely recommend checking out on YouTube at the link below. Still trying to play catch up as it is often tough to keep the pace with the reports when I string together several fishing days in a short time frame. As such, I had originally planned on passing along some more Lake Storey notes, pics and video but have elected to shift gears. Instead, you get the last of three fishing reports from my fishing “vacation” with plenty more fishing posts next week. So, first things first. 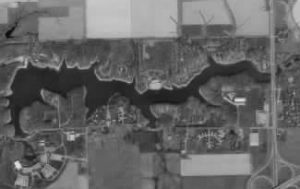 The Goal – After a pair of productive outings at Lake Storey to end the previous week I was faced with a dilemma. While Lake Storey was a blast, it typically is not my go to spot when looking for a Top 5 boost which was part of my aim on this day. However, Brent had landed three good fish at Lake Storey, all of which would have provided a bump for my rough Top 5 year. But, that’s Brent fishing and not me. I’d put my money on him for bigger fish out there as opposed to perhaps even money on the strip mines. So, off I headed for a pair of my Knox County strip mines that have solid potential for those sought after Top 5 culls. 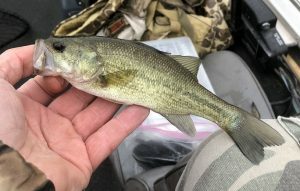 The Results – It took me 2.5 hours and two lakes to even catch a bass and not even close to knocking anything out of my Top 5. 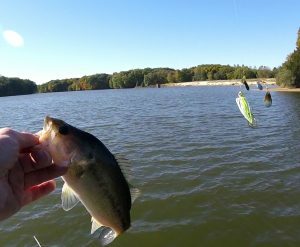 On a positive note, it only took me five minutes to land my next bass but it was an ounce lighter than the previous non-Top 5 booster. But hey, at least I was perhaps onto something. I managed another pair of short fish on Stop Two before deciding that my finale should be a return to Stop One. Yes, that’s Stop One where I had been shutout to start my day. However, the lure of some large bass that live there brought me back for one more shot. And they all ignored me yet again, shutout on both ends of the Stop One doubleheader. 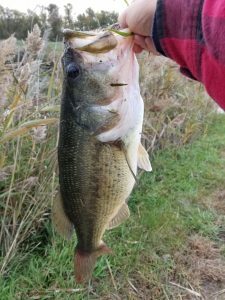 Top 5 Bass (sort of) – As soon as I arrived on Stop One, I spotted a fellow angler approaching the bank about 50 yards away. Two of his casts later, I heard him tell his wife, who was alongside him, that he had a fish and it was a good one. I proceeded to observe the battle and even from a distance it was indeed a nice bass. The angler asked if I had a scale and I then rowed over to assist with the weigh-in. Final result came in at 5-9, just what I was looking for and perhaps a good sign that some big ones would cooperate (not so much for me as it turned out). I congratulated the fellow on a good catch and, of course, gave a plug for a certain website that showcases the catches of fellow fish chasers. His wife even looked up the site on her phone as we all chatted for a bit, another cool example of how technology can actually be productive. I’ve yet to see the fish in the Inbox but time will tell. No sense in stretching this one out anymore as it was just a tough day. I briefly thought that perhaps I should have went to the well one more time with a Lake Storey outing but in the end still felt that I made the right decision. 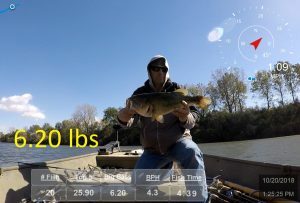 I went all in for some big bass and gave it my best shot on some good water but this time around the bass simply won. A late season doubleheader is today’s flashback feature. I looked it up and turns out that October 22, 2003 was a Wednesday back in the days where I had an odd work schedule which provided for many weekday days off. Pretty cool in retrospect and still kind of miss that aspect of my former job. You’ve gotta like being out fishing when most everybody else is at work. 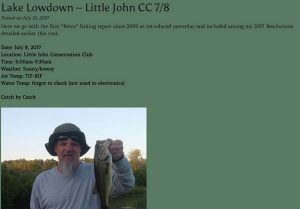 Looks like the day started tough for Dad and I at Little John Conservation Club as noted in the stats and comments from the original report. 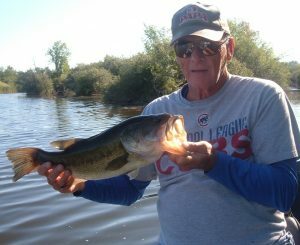 Highlights: Dad lost a nice fish on Club Lake while fishing a jig near the beach. The fish put a nice bend in his pole and despite a solid hookset, let go of the lure before we got a look. Dad nearly lost something else too, as one of my extra strength hooksets caused my lure to leave the water and nail him just below the belt. 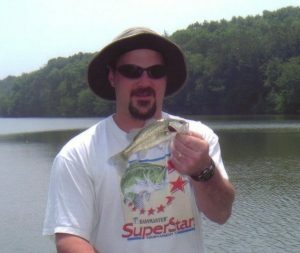 Another interesting aspect of fishing back in 2003 was that if the bass didn’t cooperate in the morning, I often had a chance to try it again in the afternoon. 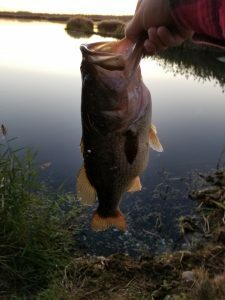 No kids kind of afforded free time like that and I took advantage on this day with a quick hit on a legendary, local farm pond. 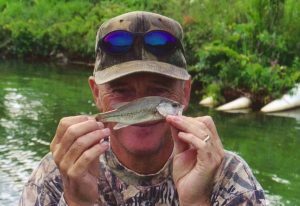 Highlights: Two bass over three pounds on the jig while fishing The Beaver Lodge will make anyone’s day. I’m glad I didn’t give up after a fairly tough morning at Little John. Nearly waited too long to get around to the Lake Lowdown project for 2018 and darn near missed out on my shot to fish Lake Storey as well. But it all worked out in the end as both items came together last week and did not disappoint. This time around I brought my brother, Brent, along on the project for the first time since the inaugural stab at the concept back in 2002 on Knox County, Illinois’ Lake Bracken. Sixteen years later we teamed up again, kicking the challenge up a notch with a visit to a public fishing hole. And a historically tough one at that. Welcome to Lake Lowdown 2018 on Knox County Illinois’ Lake Storey. 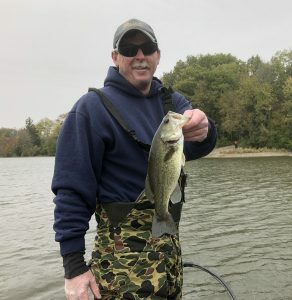 Fortunately, we didn’t have to wait too long to long to put the shutout behind us as the first bass came aboard just over 20 minutes into casting. 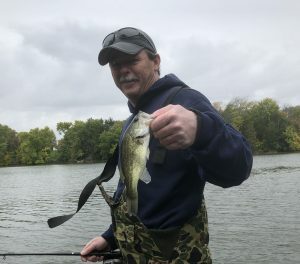 Not quite as quick as the previous day when I nabbed a bass on my first cast and not a trophy but hey, we’re on the board. It doesn’t take long for Brent to work some spinnerbait magic with his legendary creation. 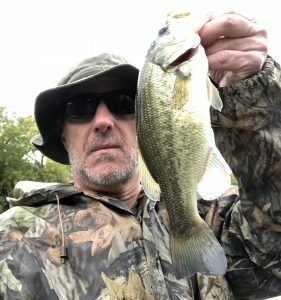 This quality Lake Storey fish comes from some manmade structure and weighs nearly a pound more than anything from my previous day on the water. But it comes with a price as it destroys the skirt on Brent’s best bait and he has no spare in tow. 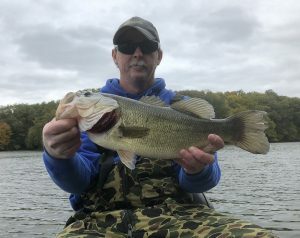 While he had to shift gears to a backup spinnerbait, Brent doesn’t miss a beat with another solid bass from the back of a shallow cove. 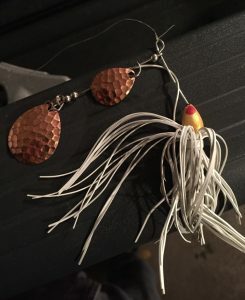 Another handmade bait is his replacement with a white skirt and tandem, hammered, copper blades. And to anybody who is reading this and is under the age of 20, well, that bait has probably been around longer than you have. Still works, though. 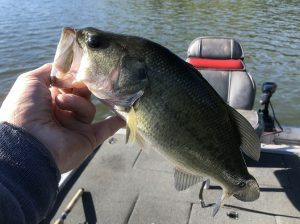 Back on the spinnerbait bite that fooled 13 bass the previous day after messing around with some unproductive crankbait casts on this morning. Brent has donned his coveralls at this point as the wind has really chilled things out despite the temperature remaining stable in the low 50s. More on his attire in a later post as I milk this Lake Storey thing across a few blog entries. A mysterious figure lurks in the background as the rain begins to come down and we kick ourselves for not bringing rain gear as we bought the forecast of no precipitation. We were taught better by that fellow looming back there on the bank. After a rain delay with Dad as we made a run for his truck (actually Brent’s as we had Dad’s), Brent wasted no time getting us back on the board. We are damp, cold and the wind is even chillier. But the bass are still biting. Not wanting Brent to have all the fun, my Top Bass for the day comes on board as I shift to a crankbait bounced around some rocks. I’d like to say it warmed me up a bit but nope, still the occasional shiver. This one completes our combined Top 5 and puts us at 7-11 and time to start culling. Not much of a bass but my only back to back catches on a day ruled by the guy in the front of the boat. Any sort of advantage that his positioning may have offered is tempered by the fact that I am confident that he would have outfished me from the back of the boat as well. 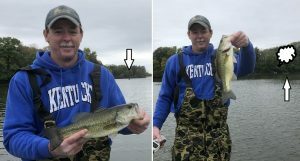 Brent lays claim to both the smallest and largest bass of the day with this catch. He would best one end of that spectrum before the day was done so don’t give up on this post quite yet. Top 5 boost up to 7-15 as this one boots our 1-3. Oh yeah, Dad came to the rescue in a return with some raingear which is a very welcome windbreaker on the blustery day. Brent moves our Top 5 up by five ounces to 8-4 as we make a second stop on a productive stretch following a shutout on another go to area. Brent boosts us another couple ounces to 8-6 in displacing our 1-5. Watch out as he is starting to heat up. Fellow Top 5 angler, John Kirkemo, fishes in the distance after our second visit of the day to compare notes. More on our meeting in another batch of notes from this outing later this week. 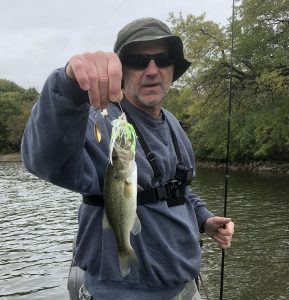 Spinnerbait Bassing 101 as multiple casts to a laydown that runs perpendicular to the bank finally gives up a bite. Lake Storey 101 if it looks good work it over good as a lot of those bass need some “convincing” before they strike. A new Lake Storey record for family and friends eclipsing the 4-8 which had stood since 2007. Lake Storey 101 again as Brent had beat this spot to death with his spinnerbait before this brute decided to eat it. Just an awesome fish as Lake Storey bass of this size don’t come around every day, no matter who you are. And how about that cull? Our Top 5 moves to 11-10 with a gain of over three pounds. 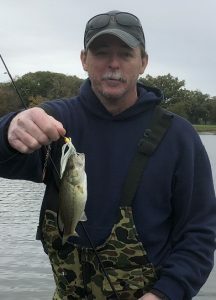 This Dam fish (that’s the location so don’t get up in arms over any questionable language) was my final bass of the day and tied me for the lead in the “Smallest Bass of the Day” category. Too chilled and beat for a celebratory fist pump though as the cold wind just continues to howl. Our plan was to fish until 3:00pm but after Brent landed another Lake Storey winner he decided that it was a fitting way to end his day. I agreed and we put our poles away and headed for the ramp (not many yards away) after a solid last cast bass. And a last cull gains us just over two pounds to finish the day with a Top 5 of 13-11. There you have it, Lake Lowdown for 2018 and many thanks to Brent for making it a rousing success. A little longwinded perhaps, but I’ve been known to do that sort of thing. However, I’d have to say blame it on the bass as they were quite generous to a couple fellows who have been chasing them for a long time. After a lengthy hiatus, I reintroduced a project last year that I called “Lake Lowdown” to coincide with kicking off my own website (snip from the 2017 post below). As a refresher, here is a little background on the project followed by some stats to get you up to speed in advance of the 2018 version hitting the blog. 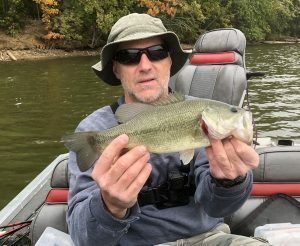 This whole thing started with my stab at fishing reports aimed at mirroring a monthly Bassmaster magazine feature entitled “Day on the Lake.” The monthly article places a pro on an unfamiliar lake and documents the highs and lows in chronological fashion as they spend seven hours on the water trying to figure things out. 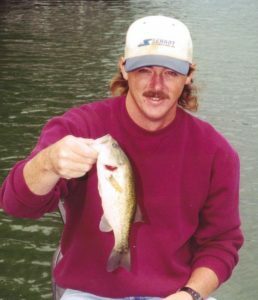 From 2002 thorough 2009 I posted seven such reports featuring either Dad or my brother, Brent, as my fishing partner. 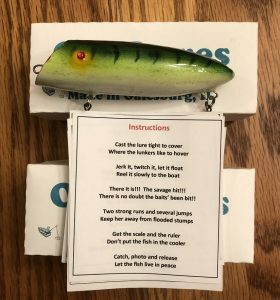 Our version of these reports differ from the pros as we have fished known locations (with one exception in 2007) and I also photograph and document the details of every bass we land for usage in the final product. While I sure dig the Bassmaster version, I much prefer our reports. Not only because it’s firsthand experience but also because it’s the real deal with a couple guys in 30 or 40 year old boats using whatever fishing gear they’ve amassed since the 80’s and showing you every fish, not just the big ones thrust out at arm’s length as close to the photographer as possible (yes, I have been guilty in the past but these days I make sure to bend them elbows). I’d like to think that it is something to which more than a few fellow bass anglers can relate. So, I brought the project back last year in conjunction with having my own blog and the 2017 outing wound up being a rousing success. However, I did note the following on the heels of the 2017 outing which took place on private waters. 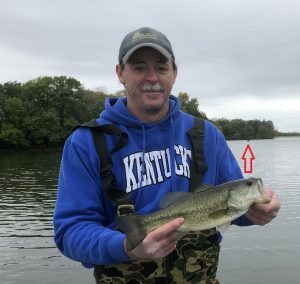 In the interest of further promoting “regular guy” fishing we do probably need to pull this stunt on public water more often although the bass just don’t jump in the boat at any of our stomping grounds, still takes some work. Well, we went “public” in 2018 as you will see in tomorrow’s report. But for today, we take a look at a brief rundown of some of the numbers from each of our previous stabs at this project. Finally able to work in a Lake Storey trip for 2018 as I was starting to wonder if I would be able to get it done before the weather got too ugly for me. 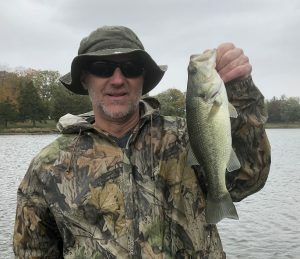 It took the investment of a pair of vacation days but certainly worth it for back to back days on my “home lake.” The first of the two reports coming at you below and happy to say some productive days on a longtime favorite fall fishing destination. 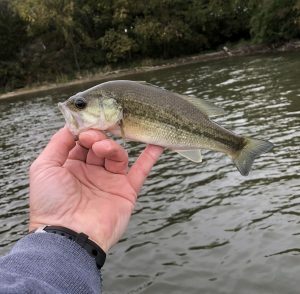 First Cast – Lake Storey can be a stingy lake at times as it supports a population of smart bass that get their education via a steady stream of angling pressure. So when you launch your boat, do your best intro, describe a historically productive spot and then proceed to catch a bass on your first cast of the day, all you can do is laugh at your good fortune. 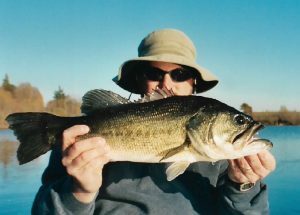 And while I’ve often viewed the “first cast bass” as a potential bit of bad luck, all worked out just fine on this day. Video of the catch below. 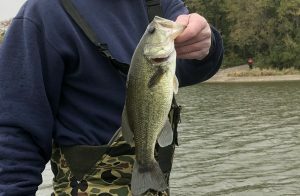 Shifting Gears – After nabbing that first cast bass on a spinnerbait, I kept on tossing it around my regular stops and it kept on getting bit. 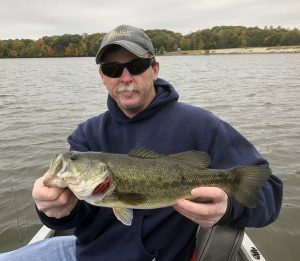 Now I’m not normally a spinnerbait guy on Lake Storey (that would be my brother Brent’s gig as we will see in the next report) as I lean towards more of a crankbait bite. But there’s no way I’m going to alter my offering when the bass are telling me that they want a spinnerbait. Yes, even as a creature of habit, I’m not that stubborn. 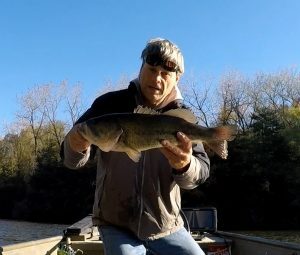 For proof, the spinnerbait caught every fish on this outing as my brief foray into other offerings (crankbaits, creature baits and lipless cranks) proved to be unproductive so I wisely set them aside. 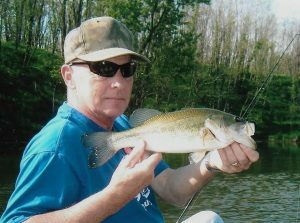 Fun in the Sun – While full sun concerns me at a number of my fishing holes, Lake Storey is not one of them as I also prefaced in my intro. Turned out just fine as all but one of my catches were soaking up some rays on the banks hit by direct sunlight. Not Made in the Shade – In contrast to the sun success, I sure couldn’t buy a bite in the shade. Even when fishing similar depth and structure it was just no go. Unfortunately, it took me a while to figure out that even my go to spots just weren’t going to work on the shady side as I went about an hour without a bite before making another run in the sun. Wood is Good – Recent rains had brought the water level up a bit compared to the full drawdown pool which was kind of cool as it brought some structure back into play. A great deal more wood in the form of laydowns and brush were now shallow targets and 9 of my 13 catches were in those neighborhoods. 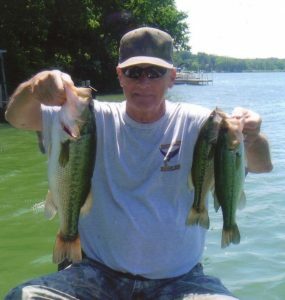 Fishing Friend – Ran into a fellow fisherman that I have known since the 80s and had a good chat which was a pleasant addition to our prodigious email correspondence discussing Lake Storey and beyond over the years. 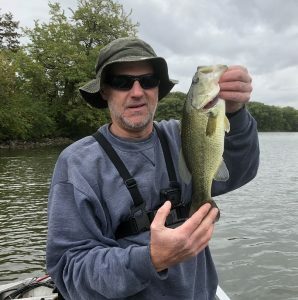 I’ll call him “Larry” and while he was walleye fishing on this day, he noted that he’d run into a few bass in the pound range and backed up my assessment on how healthy the bass looked. So while size was lacking the bass were indeed a stout sort. 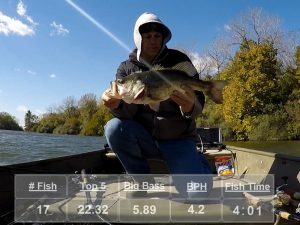 Consistency – Kind of interesting too, that my Top 5 Weight for the day of 6-2 was an exact match from my last outing on October 2, 2017. Ladies and gentlemen, children of all ages, we have for you today the Top 5 Update you’ve all been waiting for. 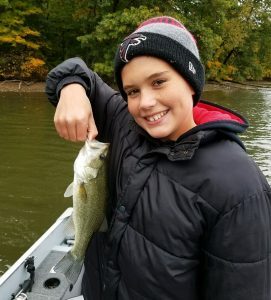 Multispecies, young angler and not so young angler submissions, a new fisherman, a new species record, a new lake record and another member joins the 20-pound club for 2018. Without further ado, here we go. Angler Comments: The catfish half swallowed dipbait hook. 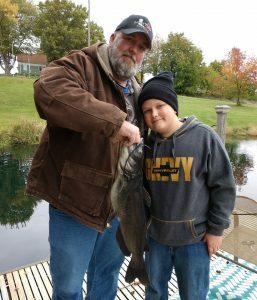 Editor’s Note: This submission represents a new Top 5 channel catfish record and kind of fun that Teagan’s fish tops the former mark set by his school principal. I encourage a little good natured ribbing from the new top dog. Structure: Submerged vegetation and wood along shoreline. 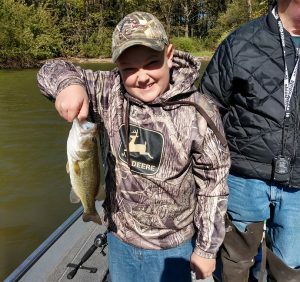 Angler Comments: Glad to finally get to go fishing with my Uncle John and my cousin, Landon. 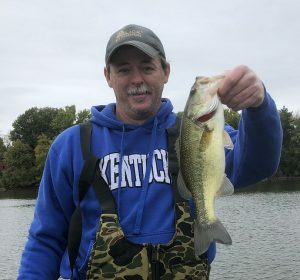 The weather was chilly but I was excited to catch my first fish this fall. It was great to go out in my uncle’s boat as opposed to fishing from the bank. 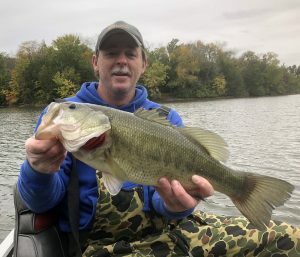 Editor’s note: This bass represents a new lake record among family and friends and a fortunate series of events surround the catch, details in fishing report later this week. Now that’s an update, folks, a stellar batch of catches and a lot to offer in terms of firsts, bests and fish stories. That’s what it’s all about and why it’s always exciting to find something new in the Inbox. Just like on the water, you never know what’s going to show up.